In his continuing coverage of NASA, Adam Fast reports from the launch site, and takes you as close as one can safely be to the flames without getting burned. Find out just how complicated this entire launch sequence was, and discover why we should be proud of the men and women who teamed up to give this important program the support it deserved. LAUNCH COMPLEX 39, KENNEDY SPACE CENTER, FL: The night before launch is very quiet. I am standing about 2,000 feet from launch pad 39A on the Atlantic Ocean as the Rotating Service Structure, which protects the orbiter while she waits at the launch pad, begins to move away - revealing the star of the show. Besides the journalists talking amongst themselves and a continual mechanical serenade of a thousand camera shutters, the dominant sound I hear seems much like the turbine Auxiliary Power Unit (APU) you’d hear on a GA ramp. systems and APUs have been fueled, but the enormous half-million gallon external tank (ET) sits empty. As I observe the scene the night before launch, there’s nothing else to do but take in the majesty that is Discovery and the rest of the space shuttle stack. This is her last ride. Once it is over, she will be safed (all fluids drained and traces of propellants removed) and move into a museum. Tonight is very foggy, with visibilities of about a quarter mile, but the fog and spotlights all around Discovery – the oldest of the fleet – hides all traces of blemish and areas that aren’t as new as they once were. Tonight, she sits glowing every bit as bright and pure as a bride - and tomorrow is her big day. My time near the launch pad ends and I bid her farewell and good night, boarding a bus for the 3.1 mile trip back to the Press Site. She will not be alone - crews will remain at the pad continuously until the very last moment to watch over her and make sure she is ready for her moment. The ET was fueled at the T (launch time) minus 6 hour mark, or 9 hours, 20 minutes before launch, and then the stack truly came alive. The extreme cold of the hydrogen and oxygen causes the stack to begin creaking and venting a very frosty breath. The tank was continuously replenished for what is boiling off until a few minutes from launch. The next morning at the press site, I stood by the road to watch the astronaut’s motorcade journey to the launch pad about 3.5 hours before launch. They are accompanied by their closeout crew, who have been training alongside them for many months. The closeout crew assists them into their seats, helps them get comfortable and cinches down their harnesses. Once everyone is secured, the closeout crew wishes them good flight and seals the hatch. This is an intricate, well-planned process that like everything in a shuttle launch, has no room for errors. At T minus 9 minutes, the countdown clock was stopped and the last planned hold of the day occurs. Every ground station in the loop was interrogated as to their status. A reply of “go” meant every parameter under their supervision was within the pre-determined safe limits. A single “no go” will stop the launch. Weather reconnaissance was flown by experienced shuttle pilots in T-38s and the modified Gulfstream II Shuttle Training Aircraft. For Discovery’s launch, a “no go” was received during this period from the Range Safety Officer (RSO) who monitors the trajectory of the launch. If something goes out of control at launch, the RSO orders the shuttle’s self-destruction before it can cause a hazard to persons or property on the ground. The RSO’s display systems were not functioning properly at the time - so the decision was made to continue counting down to T minus 5 minutes then assess the situation again. Next came orbiter access arm retraction and then the astronauts were left alone on the pad. This was the beginning of the moment they had been training months for. In the event of an emergency, the arm can be back by the orbiter’s side in seconds to allow an astronaut evacuation. The drama built as T minus 5 minutes was reached - and range safety remained a “no go.” There remains just a couple minutes before the ISS would be too far away for a launch on this orbit. Since Station travels around the earth at 17,500 mph and only a finite amount of fuel can be carried, we must launch within a 10 minute opening where its position overhead combined with the push of the Earth’s rotation on its own axis makes it possible to catch up without running out of gas. Yet, as the seconds counted down, and we all mentally prepared for a scrub and spending another day and countdown at KSC, the call came through that they were confident things were fixed - and she was going to launch today. The crowd at the press site, made up of reporters, photographers and producers plus a hundred of NASA’s “biggest fans” from the NASA Tweetup went wild with boisterous cheering worthy of any sporting event. With only two seconds left before the launch opportunity would be gone, the countdown clock was again moving. It was truly a celebratory moment. The last 15 seconds of countdown built a tremendous amount of excitement as the announcer began to speak each second. At 6.6 seconds, the dramatic atmosphere intensified further as we watched white clouds build from one side of the pad - caused by the heat evaporating water from the sound suppression water system and liquid hydrogen and oxygen burning - signaling that the main engines have ignited. The clock hits zero, the solid rocket boosters ignite, all 8 explosively charged “frangible” nuts detonate and split in half, releasing the shuttle from the 28” long 3.5” bolts keeping it upright; and we’re left speechless watching the massive shuttle stack launch straight up. The solid rocket booster smoke is vented to the opposite side from the main engines, and it catches up to the cloud on the opposite side very quickly. The climb starts out slowly – we have a launch. The flame is brighter than anything we’ve ever seen, but we cannot look away. The only sound is the cheering of the crowd as they take in this extraordinary sight. After clearing the support structure tower and gaining about 200 feet of altitude though, Discovery begins to roll into an inverted attitude, and at this time we begin to experience the intense sound. Forget just hearing these awesome decibels, no, we’re EXPERIENCING this sound as the pressure waves hit us in the chest with a dramatic thump-thump-bump-thump many times a second. You can hear the gigantic Vehicle Assembly Building (VAB), the fourth largest building in the world, behind you ‘singing’ as it resonates from the sound vibrations and pressure. We are more than three miles away, and as Discovery climbs higher, the sound begins to fade and is replaced by dozens of activated car alarms creating an enormous racket. This is the closest NASA feels it safe for people to be to a launch. Even at a distance of 800 feet, the sound pressure wave would be fatal to humans. The rest of the distance is a buffer in case an explosion occurs. After the roll to a inverted attitude is complete, the main engines are throttled down to 67% power as the stack passes through “Max Q”, the highest amount of pressure encountered during acceleration as it passes through Mach 1. Mission Control calls “Discovery, go at throttle up” which signals crew inputs raising engine power back to 104%. The loud and visible portion of the launch is over from the ground within 2.5 minutes as the solid rocket boosters (SRBs) are released and we see one bright point turn into three. One, Discovery, will continue up, while the SRBs begin to fall away before burning out and disappearing. After almost 6.5 minutes, the main engines are cut off - but it’s beyond the view of even the gigantic television camera lenses used to track and watch for foam and debris strikes. 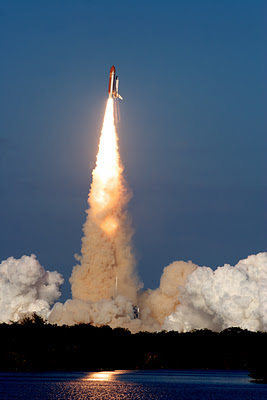 Discovery and her crew have reached orbit. The external tank separates and is photographed by the crew for analysis on the ground. The mission has begun! However it’s taken months to get to this point as Discovery officially enters “space,” so let’s take a short moment to appreciate what got us here. After the arrival of the completed SRBs from prime contractor ATK in Utah and the ET from the Michoud Assembly Facility in Louisiana, they were moved into the Vehicle Assembly Building and brought to vertical. As the orbiter reached completion for flight, it was hoisted onto a large flatbed truck for the short trip from the Orbiter Processing Facility to the VAB. Once inside, she was hoisted, raised into the vertical, and mated to the waiting ET/SRBs on an Mobile Launcher Platform (MLP). About a month before launch and after more inspections and checks, the MLP was put on the crawler and carried down the “crawler way” at a blistering speed of less than one mile per hour. Let me give you a specific example to convey how highly-engineered and well-thought out every aspect of these pre-launch events were: The crawler way is a bed of river rock from Alabama and Tennessee. The cleavage (think back to Physical Science, this is how the rock breaks) of this particular rock was necessary because it allowed for the tightest possible turning radius of the 17-million-pound loaded crawler. Asphalt, dirt or normal rocks would have required a significantly longer road with broader turns and drastically thicker surfaces to hold up this weight. When you scale this degree of engineering and attention to detail to every system involved in Discovery’s launch, it is easy to quickly realize what has made our space program so great. Once at the launch pad, the bulk of the payload for the mission was raised and installed and secured in the payload bay inside of the Rotating Service Structure’s Payload Changeout Room. The hardware wasn’t the only piece of the puzzle undergoing preparation, however. The astronauts have been training for their duties, be they flight or mission, for months in a wide range of simulators in Houston. About a month before launch, a Terminal Countdown Demonstration Test was held in Florida with the crew. This is a full-on dress rehearsal of every person contributing to the launch, conducted identically to the real countdown. The tanks were not filled and nothing was lit, but everything else was the same. It ended much like all of their simulator training - with a catastrophic failure requiring an emergency disembarkation and a possible ride on the crew emergency slide wire baskets. Each crew member was also trained on driving the escape vehicles, which are M-113 armored personnel carriers. This space shuttle launch was an elaborate dance involving millions of steps and thousands of participants; a single misstep in key areas or a combination of them in others can lead to catastrophe. It was a testament to man’s ability to achieve when properly focused, and showcases American values of bravery, preparation, planning, attention to detail, with a little stubbornness mixed in. There’s absolutely nothing like it anywhere else on earth. Dedicated to James D. Vanover, a launch pad engineer who lost his life in a tragic accident while preparing for the STS-134 Mission, and all NASA contractors and civil servants whose dedication to perfection in Human Space Flight has led, and will continue to lead, this amazing program.